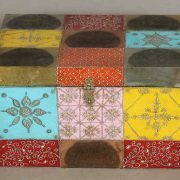 A wide blanket box with nine Buddha heads all the way round. 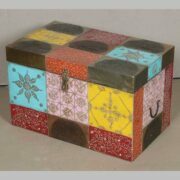 This wide trunk is made from reclaimed wood and has nine brass plate Buddha heads on front and sides (hence the name). Nine is a sacred number and lucky for some. Finished with pastel cream, blue and green, this trunk has nicely turned feet, but a flat back, so isnt suitable as a coffee table.